Above: You've come a long way, demon space baby. January was a dead month, even by January standards. I haven’t filed a review since publishing Lost in Shadow on Joystiq at the beginning of the month, and even though right now I’m playing LittleBigPlanet 2 for a review, spoiler alert, I find it hard to play that game for more than an hour without getting frustrated and wanting to move on to something else. For the most part, I haven’t minded having these few weeks off from playing. A hiatus can refocus the mind. But after awhile, those old familiar urges creep back, and I find myself wanting to play something -- anything. I’ve laid out my philosophically confused position on demos before. It’s not something I feel strongly about, but I try to avoid them when I can. They’re advertisements, not really games, and if I know I’ll end up reviewing something then I like to go in cold if I can help it. On the other hand, theoretically everything you’d see in a demo will be in the final game, and, if done well, a demo can be a worthy standalone product, like a good movie trailer. So given my lack of conviction on the issue, and my fiending for something new to play, I downloaded a couple of new demos: Dead Space 2 and Bulletstorm. Dead Space 2 is a game I was looking forward to, but when circumstances kept me from being able to review it, I filed it under the “wait until it’s cheaper” category, which is never a bad idea for any game. Maybe I should be more excited. 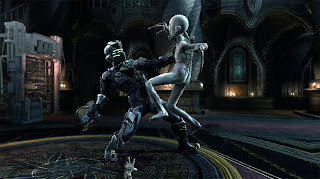 I liked Dead Space when I played it, and found that my opinion of it improved with time, even though I never revisited it. Then, I loved Dead Space: Extraction, the prequel that came out for the Wii (the inclusion of an HD version of Extraction on the PS3 edition of Dead Space 2 is reason enough to pick it up). I should have been a prime customer. There’s something to be said for a game with such a polished presentation. People these days are so enamored of low-fi indie games that it’s almost become gauche to appreciate a game with good graphics and responsive controls. Which is not to say that Dead Space 2 avoids all of the problems of today’s AAA shooters – one look at the control scheme almost gave me heart palpitations. Then again, I am old, and eat a diet high in fat, so maybe it was something else. The demo does not begin with a bang. Isaac walks through four identical rooms before anything happens, and when something does happen, it’s the same attack of the Necromorphs that was replayed endlessly in the first game. They jump out of cryogenic chambers, and ventilation shafts, and who knows where else. All I can say for sure is that there always seemed to be one behind me. This was enough to convince me that Dead Space 2 may not be likely to change its ways, and that it is satisfied enough that withering, high-tension action scenes are sufficient to be called horror. Next, you encounter an environmental puzzle in which you use telekinesis to pull clearly marked clamps down from the ceiling. Hardly a brain buster, this felt a little rote and obligatory. I could almost hear someone in charge saying, “Y’know, we just had a big action scene, so we should probably put a puzzle here.” That’s not meant to be a damning criticism, just an observation. And it was followed by a zero-gravity sequence that I found heartening – Isaac is fully controllable in these scenes this time around. I didn’t think the zero-g scenes in the first game lived up to their potential, so I’m encouraged that they may do so this time. Then, I walked into a church and was attacked by a bunch of screeching alien baby people. Not what I expected. I think that’s the first time I’ve been able to say that about a Dead Space game. 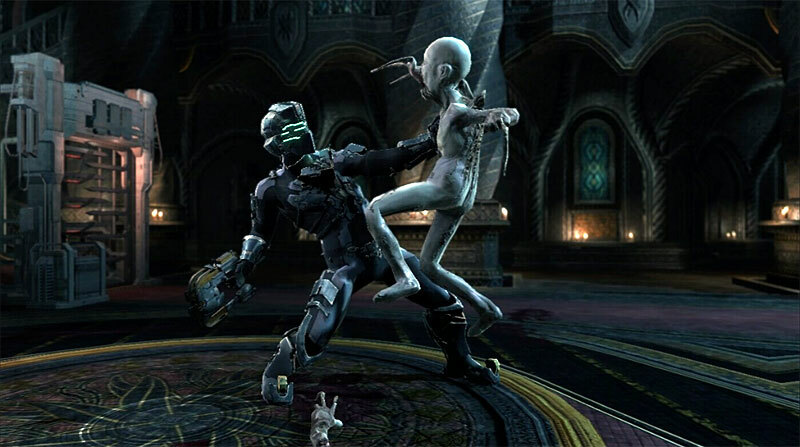 This part of the Dead Space 2 demo accomplished a couple of the things that the first game never did. For one thing, it was an interesting environment. I liked the Ishimura as a functional space vessel, but I was never as enamored of it as some people were. It’s nice to see that the sequel branches out a little. As for the screeching space babies, they’d probably get old if the game relies on them too much, but they made for a nice change of pace. So, good job, Dead Space 2 demo: You have kept my interest. But I’ll still probably wait for a sale. Glad you commented on this - it did feel like the church sequence was very much targeting people who'd played the first game. Because: so far, so sci-fi corridors and necromorphs and gore and blah-y puzzling. And then you go into a metal lift and come out... in a giant church, with a model of a marker in, and a very different lighting feel. And, subsequently, you get to see outside, across the Sprawl. It's a reveal designed for the fan: making it quite clear that while some stuff is the same, there's a whole new bunch of environmental design in there. I thought, in terms of pacing, that was a neat move. (Although I'm not a fan of the new, slightly dumbed-down crosshair). I played the demo for Dead Space 2 and I have agree it was good but nothing amazing. The demo at the moment that has caught my attention has been BulletStorm because I have never known myself to play a demo more than twice in a row. You may want to talk to your nephew about LBP2, I'm not sure he agrees. I don't think anybody agrees. Games are quite expensive and it really gives me a hard time having them. I agree with you, we just need to wait to afford it. I love games too and they give me a lot of enjoyment especially while I'm playing it with my friends. Actually, I have to say I totally agree with you on LBP2 - my own experience is nearly parallel. I bought it because I was interested, but it was mainly to review it. I'm maybe halfway through, have been browsing the mostly uninspired community creations, and I don't think I've even touched the game in over a week. Not doing it for me, one bit. You can borrow the free Phoenix copy if you want. I'm not even sure I want it back, because that game terrified me, and I don't know if I have the emotional fortitude to play it again. It wasn't a perfect game, but it definitely was a scary one, at least for me. Good enough to play more than once, on a higher difficulty or whatever, if I were brave enough.